Is falling asleep at night difficult for you? Have you given up on counting sheep? A good night’s sleep is an essential part of starting your day off right. Be Better Movement wants to help you get a full night’s rest so you can conquer your day, every day! Creating a night time routine is a great way to embrace the habit of a better sleep cycle. 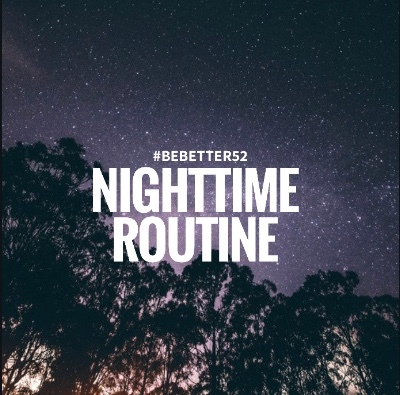 This week’s #bebetter52 challenge is to turn off all electronics at least 20 minutes before bed and take time to unwind by adding a relaxing new nightly ritual. Once you discover your most effective sleep ritual, keep the night time routine up! Turning off all electronics, including your phone, 20 minutes before you sleep can also improve your night of rest. The blue light given off by electronic screens sends a signal to your brain it’s daytime, even when it’s not. That wake-up signal leaves you feeling revved up right before you hit the sack. So make sure to turn on your morning alarms, put your phone on silent, and swap out your phone for a book to read or a journal to write in or even yoga to practice before you turn out the lights. If you still have trouble sleeping after a relaxing nighttime routine, incorporate essential oils or melatonin into your night. These are great natural remedies to help you sleep. Lavender essential oil helps to calm the mind and body, resulting in better sleep. You can use lavender by putting 1-2 drops, mixed with lotion, on your chest or feet. *Melatonin is a homeopathic sleep aid that should be taken 30 minutes before bedtime to help decrease the time it takes to fall asleep. Cut out the caffeine before dinner. Take a warm shower or a relaxing bath at night. Put on an eye mask. Play soothing music or sounds. Deep breathing or mediation.Your well-rested body and mind will thank you. Friends and family will probably thank you, too. *Make sure to consult your doctor before taking any new medication or herbal supplements!